Twelve years of making a difference one shot at a time. Our April Sponsors of the Month are Brownells and CZ-USA! Established in 1939, Brownells is the world’s greatest supplier of all things to maintain, upgrade and fix your firearms. Our trailer is well stocked with Brownells cleaning rods, brushes, and spare parts, keeping all of our shotguns in tip top shape all season long. You may have even seen the Brownells gunsmith screwdriver kits in our raffles, and this year we're giving away one of their retro rifles in our yearly raffle! A big thanks to Roy Hill for all of your continued support. We have featured CZ-USA's line of shotguns on our trailer for the past 5 years, and this year, once again we are giving away a Made in the USA Dan Wesson 45 ACP Pistol in our yearly raffle. Special thanks to Dave Miller our "Guinness Book of World Records" rep from CZ-USA, who has consistently been very supportive of our mission. For more info visit CZ-USA.com. We are happy to announce that Buck Knives and Peregrine Field Gear are our Sponsors of the Month for March! With over 110 years of experience making high quality, Made in the USA hunting and tactical knives, Buck uses only the best materials and is continuously focused on innovation via their state-of-the-art technology. Each knife comes with a Forever Warranty because of how strongly Buck believes in the integrity of their products. Supporting Shoot for a Cure and our mission for over 12 years, we are proud to give a USA MADE Buck pocketknife to every shooter who comes to one of our events. In addition, you'll see Buck items that have been generously gifted to us in each of our event raffles. This year we are giving away the original BUCK 110-the knife that started it all and of course, a one of a kind custom knife in our big yearly raffle. Many thanks to CJ and Billy at Buck Knives for your continued support! At Peregrine Outdoor Products, their goal is to bring customers innovative and high quality products that help people better enjoy their outdoor experience. If the right product for the job already exists, Peregrine will find it. If not, they are likely working to design a solution themselves. All Peregrine Field Gear, MizMac, Classy Clays and Wild Hare products are proudly manufactured by Peregrine Outdoor Products and are backed by their 100% "no questions asked" satisfaction guarantee. This year we are featuring their Insulated Venture Bucket Packs, Wild Hare Tweed Pouches and Shotgun Cleaning Kits in our event raffles. Special thanks to Michael for all the support! For more info visit peregrinefieldgear.com. We're excited to announce our first two Sponsors of the Month for January 2019, Remington and Stack-On. For more than 200 years, Remington has been building revolutionary firearms that capture the spirit of a rich American sporting heritage. We're proud to feature their 1100 Sporting, VersaMax and V3 shotguns to demo on our shoot trailer. A generous sponsor of Shoot for a Cure and our mission for many years, we're so grateful for all that the team at Remington does for us. For more info, visit remington.com. Another of our longstanding supporters is Stack-On. For over 40 years, Stack-On's Gun Safes have always been #1 in the industry in innovation, style and quality. They've outfitted our trailer with their gun storage solutions and we give away an electronic 40 gun safe in our yearly raffle each year! Many thanks to the folks at Stack-On, we love your products! For more info, visit stack-on.com. Our December sponsors of the month are CZ-USA and Silver Stag! Although CZ's company history dates back to the 1930s, it was in the second half of the 1980s when a corporate modernization and restructuring process began that CZ-USA/Dan Wesson began to put an emphasis on their firearms product range. (Something we love about their products!) We feature their complete product line of over/under shotguns on our trailer for folks to demo and we give away a Dan Wesson Commander .45 in our Yearly Raffle. Special thanks to Dave and Danae for all of your support! For more info visit cz-usa.com! SILVER STAG was founded in a garage by a couple of sportsmen who enjoyed turning old files and saw blades into hunting, fishing, and camping knives. Over the past 18 years, they have been extremely focused on improving their quality and selection, though they've never strayed from their original hands on approach to MDE IN THE USA manufacturing, producing some of the most beautiful, functional, and durable blades in the industry. We give away two of their beautiful ESLE Hunter knives at each event raffle and we give away a one of a kind limited edition custom knife each year in our Yearly Raffle. This year’s knife was made from steel from the World Trade Center! Many thanks to Brad at Silver Stag! For more info, visit silverstag.com. It’s such a pleasure to wrap up each season making a round of phone calls with good news. Here are this year’s yearly raffle winners! 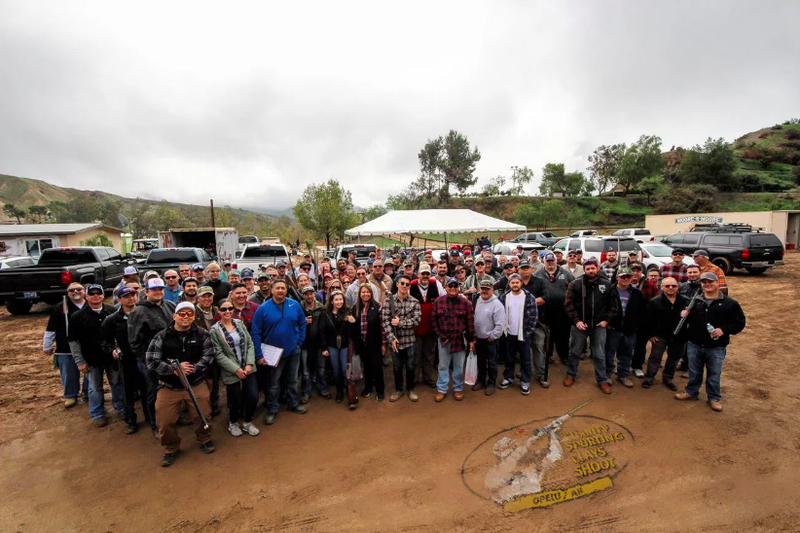 Congratulations to all of you, and thank you to all of our generous sponsors and shooters for a successful 2018. Your continued support truly means the world to us. Meet Lou and Jan Ulsch: Lou Ulsch (retired UFCW) and our long time LLS East Coast Coordinator, retired from LLS in 2016. His wife Jan retired from her job last year as well. 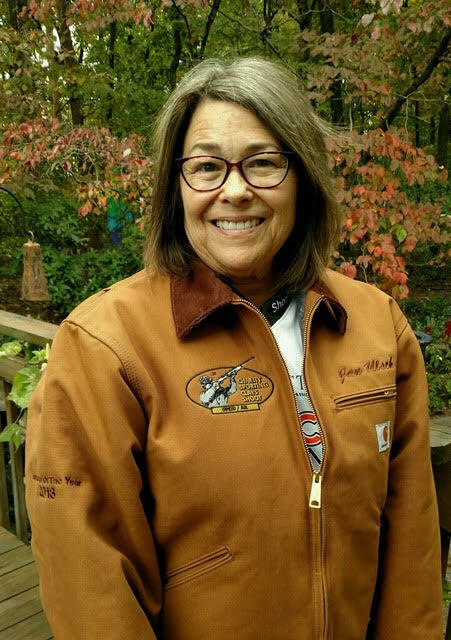 Since that time, Lou and Jan have attended almost every event coast to coast and have developed a passion for sporting clays. They come early and stay late and are always a huge help to the organization and the crew. Any job that needs done and any way they can help-they are always there for us. That being said, we are very pleased and proud to announce that Lou and Jan Ulsch are the 2018 SFAC Instructors of the Year! We couldn’t think of two more deserving people and we love them very much. Here’s to many more years ahead-Congratulations!!! Our October sponsors of the month are Browning and Walker’s! Browning was started in 1878 by John Moses Browning at his father's store in Ogden, Utah. Today, 130 years later, Browning has grown to be the leader in sporting arms, technical hunting clothing and many other outdoor-related product categories, all helping to make your hunting and shooting experience a success. As our longest standing Corporate Sponsor, we are proud to have ALL of the different models of Browning shotguns on the trailer for folks to try out at any of our events, as well as Browning Shooter apparel in our raffles. Special thanks to Scott and Shaundi for all of your support! For more info visit browning.com! For over 25 years Walker’s has developed innovative solutions for hearing protection and enhancement. 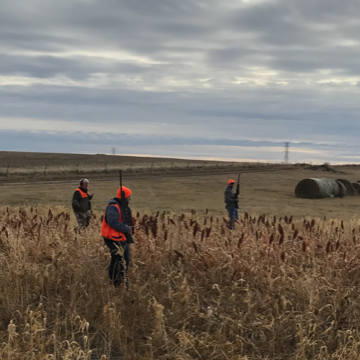 For hunters, the Walker’s line of products are the industry standard in hearing enhancement and protection, and we’re excited to feature the Game Ear products in our raffles at every one of our shoots! Many thanks to Ben at GSM Outdoors. For more info, visit walkersgameear.com. Big congratulations to one of the winners of our annual raffle, UFCW Local 555’s Elisa Gonzales! Our sponsors of the month are Beretta USA and Leatherman! Beretta has been making fine Italian firearms since the 1500s. Through those centuries of experience, Beretta has held true to their core value of quality without compromise, and their investments in technology have resulted in some of the best firearms on the market today. We have everything from the A300 to the Silver Pigeon O/U shotguns on the trailer to demo and we are giving away A400’s in our shotgun raffles this year. Many thanks to Brenda and Ryan. Your support over the years means the world to us! For more info visit beretta.com. Made in the USA, Leatherman tools have been proudly made in Portland, OR since 1983. Their Multi-Tool has been the industry standard that all others have been inspired by since their very first creation. This year, Shoot for a Cure will be giving away the new Signal Multi-Tool and the innovative Leatherman Tread Multi-Tool Bracelet in all of our event raffles. Special thanks to Scott from Leatherman! For more info, visit leatherman.com. MN Event Special Youth Guests! We just did our first event in MN on 8/22 at the Caribou Gun Club and we saw a great opportunity to promote the NSSF and National Shooting Month. 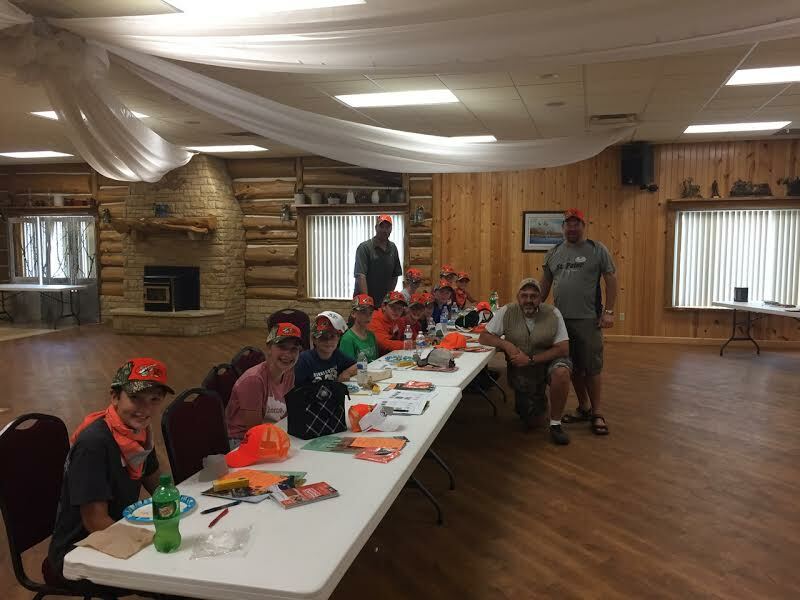 While setting up last Monday, we met a class of local youth and their instructors taking a hunter certification class and we decided to give each of the kids a Shoot For A Cure hat and Buck knife. 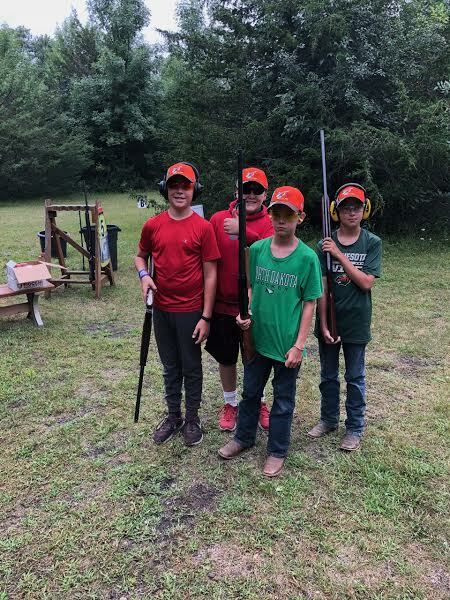 We then asked the instructors (who were also the coaches of the St. Paul High School Trap team) if they would like to bring 2 squads of youth to shoot as our guests the next day at the event. They brought 4 kids from the high school team (2 kids finished 5th in the US last year) and 4 new kids (future members of the trap team). They had a BALL - the coaches team finished 2nd, the older kids finished 3rd and the young kids took home most of the raffle items!!! It was an awesome day and we promoted the NSSF throughout the entire event. It was a real pleasure to be able to be in a position to comp the day for these kids. They will all be back next year. August Sponsor Spotlight: Blaser and The Original Muck Boot Co.
August's Sponsors of the Month are Blaser and The Original Muck Boot Company! The Blaser F3 and F16 are some of the finest over and under shotguns on the market and we have two of each on the trailer for folks to shoot at our events! The F3 comes in many configurations and is used for everything from clays to game. The new F16 was created and designed with the clay shooter in mind and it is one sweet shooting shotgun. The F3 is also featured as our grand prize in our yearly raffle, and it’s custom made each year to the specifications of the winner! Special thanks to Christian and Janet - your support means everything to us. For more information visit blaser-usa.com. The Original Muck Boot Company. 's boots are some of the most popular raffle items at our events. The Woodland Extreme is a great insulated hunting boot, and the Woody Sport Cools are some of the best boots out there, keeping your feet cool on warmer days. And don't forget the women! Muck Boot Co.'s women's styles are fashionable and functional. This year, each boot winner gets their choice of boots from the Muck lineup. With many styles to choose from, the decision can be tough. A big thank you to The Original Muck Boot Company for all you do for us throughout the year! For more info visit muckbootcompany.com. Our July Sponsors of the Month are F.A.I.R. and Otis Guncare! Part of the Rizzini family of fine Italian shotguns, F.A.I.R. is a welcome addition to our family of sponsors starting this season. Since 1971, F.A.I.R. has specialized in the manufacture of functional and highly reliable sport and field shotguns. Shoot for a Cure is featuring their beautiful Carrera sporting clays over under and their new Iside side by side on our trailer. Many thanks to Justin at F.A.I.R.! For more info, visit italianfirearmsgroup.com/fair. We're proud to have another great made in the USA product joining us as a new sponsor! 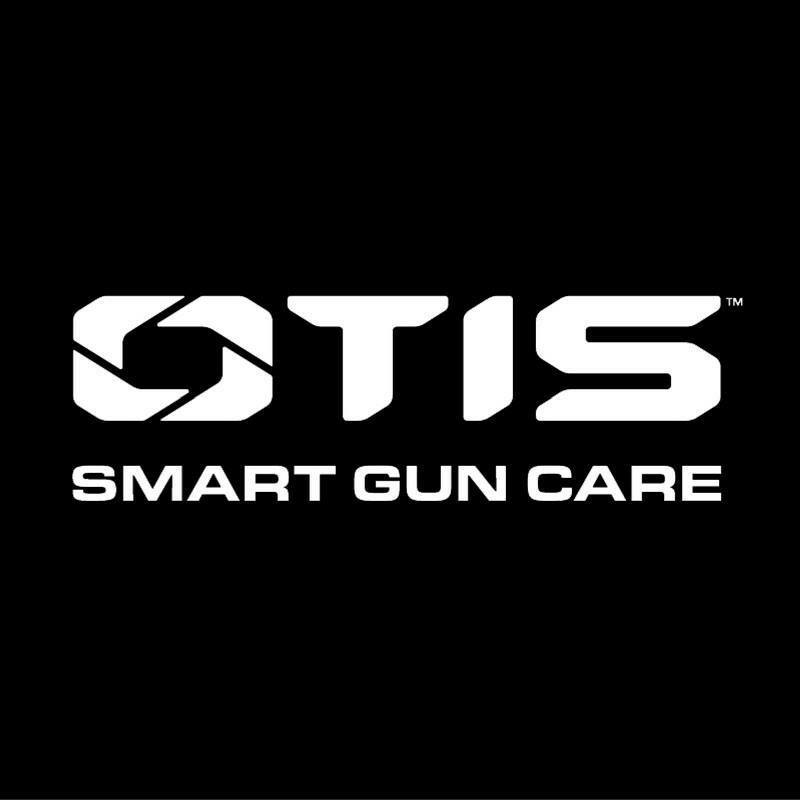 Founded and built in northern New York, Otis Guncare works endlessly to be trailblazers so that their products help passionate gun owners to get more from their firearms. We're excited to be featuring their USA made Patriot and Wingshooter cleaning kits in our event raffles this season. Many thanks to Emily and Ron at Otis! For more info, visit otistec.com. "In our opinion, Fiocchi Shooting Dynamics is the best economical target load out there and is the official ammo of Shoot For A Cure. It is consistent, hard hitting, and clean - we very rarely have a failure. We see over 1300 shooters each year and we clean 40-60 loaner guns after each event. When you shoot as many rounds thru those guns as we do, it's nice to know that they will function for the entire event and clean up fairly easily. We rely on Fiocchi Shooting Dynamics for a great shooting experience for all of our shooters." Many thanks to Carlo and Jackie, your continued support throughout the years means everything to us!!! For more info, go to www.fiocchiusa.com. Orion Coolers has been a welcome addition to our family of sponsors these past few years. Their 100% Made in the USA coolers are packed with features like certified bear resistant locks, motorcycle grip carry handles, bottle openers, and best-in-class 2"+ insulation, among other things. We're proud to feature their high quality Orion 45 Cooler at all of our event raffles, and to keep your drinks cool on the course as well. Big thanks to Damon from Orion for your support of Shoot for a Cure! For more info, visit orioncoolers.com. Great scores, great time, and all for a great cause! Last year we decided to enhance the Shoot for a Cure event to handle two different types of shooters. The NSCA shooter and the Fundraiser shooter (and both for some people). Holding events all weekend over the 10th and the 11th was a ton of fun. Especially with Mark Gagliardi and his band of shooting event experts on hand to make both days something to remember. Mark even came up with the new Moore N’ Moore promo song for our reopening. Video is posted below…as you sing along, be sure to replace “more more more” with “Moore N’ Moore” and “ooh how do you like your love?” with “oooh how do you like our club?”. Clever! He even called me up days later and opened the conversation with that….scary stuff, I tell ya. While the NSCA shoot only had 52 shooters, the Sunday event had over 112 and boy was it muddy on Sunday. Saturday was actually the best day to shoot since it started raining as the event ended and the raffle began. The weather proceeded to rain through the day and night and left Sunday a muddy mess (I know it’s too late, but the mud issue has been addressed). I believe it was referred to as the peanut butter parking lot by the S4AC crew. That didn’t stop the good times from happening though and the heavy-duty fundraising activities by the S4AC crew. Lunch? An incredible lunch was provided by Wolf Creek Restaurant in Valencia. They served an Alfredo chicken on Saturday and Tri-Tip on Sunday and the side dishes were rib-sticking good stuff like baked beans and garlic mashed potatoes. Read the full recap here! Check out our very own Mark Gagliardi talking about Shoot for a Cure on Cam & Co at NRA TV! Our sponsor of the month for January is Spring Creek SD Outfitters! One of our favorite raffle prizes to award at every event raffle is the trip to their Resort and Deep Water Marina, but instead of us telling you about our sponsor of the month, let’s hear it in the words of John Zanotti, one of our recent hunt winners! "The trip was great! 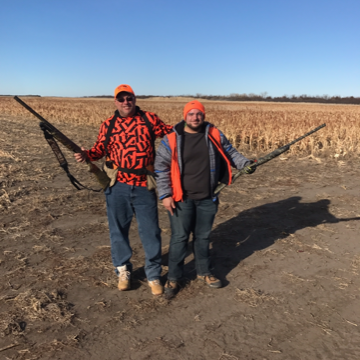 I brought my 22 year old son Zachary and neither of us ever hunted before. From the time I called to make my reservation up to the end of our trip, David and Angela from Spring Creek were so accommodating. They picked us up at the airport and we stopped for lunch before taking us to our own lake front cabin. We walked along the property and lake, then relaxed in our cabin before going to dinner at the Lodge. It was there we met our fellow hunters and had an amazing home style dinner in a small relaxed environment, and then we worked our way to the bar area where Angela served us some super cocktails as we all watched the college football games on TV and would take cigar breaks on the outside deck. The hunt started the following morning and they made us feel very comfortable by explaining what to do and what to expect. After the second day of hitting our limit, we felt like experienced professional hunters. We made some new friends that we now keep in touch with and will hunt again together. Dave offered to have the pheasant cleaned and shipped to our homes, which I had him do. When the pheasant was delivered it was cleaned and vacuum sealed in plastic and came frozen. I quickly defrosted some and made it for dinner that night and it was AMAZING!!!! This was an experience my son and I will never forget." Special thanks to David and Angela for your continued support! For more information, visit springcreeksd.com. People really do win every year at Shoot for a Cure! We love being able to give away so many of the industry's best products from our generous sponsors at each event. Here are some if this year's winners with their prizes! First is Ryan Bohnet who won the Orion Cooler and the SKB Double gun case at one of our last events of the year. Next, FJ Collins, our Yamaha yearly prize winner with his generator and power washer. Congratulations to all of this year's raffle winners, and we can't wait to see you on the course in 2018! Our December sponsor of the month is Leupold Optics. Leupold is the #1 most trusted name in riflescopes and outdoor optics and is a longtime supporter of Shoot for a Cure. Based in Beaverton, OR, Shoot for a Cure features their Made in the USA VX-1 riflescopes at each of our event raffles, and the VX-3i riflescope and their new LTO Tracker in the yearly raffle. Many thanks to the team at Leupold for their ongoing support. For more information, visit Leupold.com. It means so much to us each year to have the support of these incredibly generous sponsors, and we love getting to announce the winners of our yearly raffle. Here are this year's - Congratulations to you all! Our November Sponsor of the Month is Lincoln Traps! Lincoln Traps, one of our newest sponsors, is proudly Made in the USA right in Lebanon, PA. Shoot for a Cure is excited to demo their awesome Rabbit/Chandelle machine (the best in the industry) in our world famous Shoot for a Cure Flurry at each event. Special thanks to Rod and Kris for your support. For more info, visit LincolnTraps.com lincolntraps.com.